Marble bust of Aristotle. Roman copy after a Greek bronze original by Lysippus c. 330 BC. The alabaster mantle is modern. 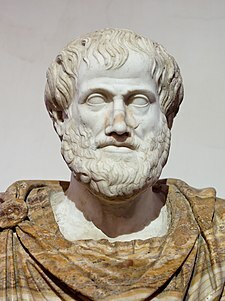 Hi Aristóteles o Aristotle (Griniyego: Ἀριστοτέλης, Aristotélēs) (384 BC – 322 BC), hya amo an usa ka Griyego nga pilosopo, tinun-an ni Platón ngan magturutdo kan Alejandro nga Harangdon. Nagsurat hiya hin durudilaiin nga butang sugad han pisiko, metapisiko, siday, teatro, musika, lohika, retorika, politika, kagamhan, etiko, biyolohiya, ngan zoolohiya. Ackrill J. L. (2010). Essays on Plato and Aristotle, Oxford University Press, USA. Ackrill, J. L. (1981). Aristotle the Philosopher. Oxford and New York: Oxford University Press. Adler, Mortimer J. (1978). Aristotle for Everybody. New York: Macmillan. A popular exposition for the general reader. Ammonius (1991). Cohen, S. Marc; Matthews, Gareth B. eds. On Aristotle's Categories. Ithaca, NY: Cornell University Press. ISBN 0-8014-2688-X. Aristotle (1908-1952). The Works of Aristotle Translated into English Under the Editorship of WD Ross, 12 vols. Oxford: Clarendon Press. Barnes J. (1995). The Cambridge Companion to Aristotle, Cambridge University Press. Bocheński, I. M. (1951). Ancient Formal Logic. Amsterdam: North-Holland Publishing Company. Bolotin, David (1998). An Approach to Aristotle's Physics: With Particular Attention to the Role of His Manner of Writing. Albany: SUNY Press. A contribution to our understanding of how to read Aristotle's scientific works. Burnyeat, M. F. et al. (1979). Notes on Book Zeta of Aristotle's Metaphysics. Oxford: Sub-faculty of Philosophy. Cantor, Norman F.; Klein, Peter L., eds. (1969). Ancient Thought: Plato and Aristotle. Monuments of Western Thought. 1. Waltham, Mass: Blaisdell Publishing Co..
Chappell, V. (1973). Aristotle's Conception of Matter, Journal of Philosophy 70: 679–696. Code, Alan. (1995). Potentiality in Aristotle's Science and Metaphysics, Pacific Philosophical Quarterly 76. Frede, Michael. (1987). Essays in Ancient Philosophy. Minneapolis: University of Minnesota Press. Fuller, B.A.G. (1923). Aristotle. History of Greek Philosophy. 3. London: Cape. Gill, Mary Louise. (1989). Aristotle on Substance: The Paradox of Unity. Princeton: Princeton University Press. Guthrie, W. K. C. (1981). A History of Greek Philosophy, Vol. 6. Cambridge University Press. Halper, Edward C. (2007). One and Many in Aristotle's Metaphysics, Volume 1: Books Alpha — Delta, Parmenides Publishing, ISBN 978-1-930972-21-6. Halper, Edward C. (2005). One and Many in Aristotle's Metaphysics, Volume 2: The Central Books, Parmenides Publishing, ISBN 978-1-930972-05-6. Irwin, T. H. (1988). Aristotle's First Principles. Oxford: Clarendon Press, ISBN 0-19-824290-5. Jaeger, Werner (1948). Robinson, Richard. ed. Aristotle: Fundamentals of the History of His Development (2nd ed.). Oxford: Clarendon Press. Jori, Alberto. (2003). Aristotele, Milano: Bruno Mondadori Editore (Prize 2003 of the "International Academy of the History of Science") ISBN 88-424-9737-1. Kiernan, Thomas P., ed. (1962). Aristotle Dictionary. New York: Philosophical Library. Knight, Kelvin. (2007). Aristotelian Philosophy: Ethics and Politics from Aristotle to MacIntyre, Polity Press. Lewis, Frank A. (1991). Substance and Predication in Aristotle. Cambridge: Cambridge University Press. Lloyd, G. E. R. (1968). Aristotle: The Growth and Structure of his Thought. Cambridge: Cambridge Univ. Pr., ISBN 0-521-09456-9. Lord, Carnes. (1984). Introduction to The Politics, by Aristotle. Chicago: Chicago University Press. Loux, Michael J. (1991). Primary Ousia: An Essay on Aristotle's Metaphysics Ζ and Η. Ithaca, NY: Cornell University Press. McKeon, Richard (1973). Introduction to Aristotle (2d ed.). Chicago: University of Chicago Press. Pangle, Lorraine Smith (2003). Aristotle and the Philosophy of Friendship. Cambridge: Cambridge University Press. Aristotle's conception of the deepest human relationship viewed in the light of the history of philosophic thought on friendship. Plato (1979). Allen, Harold Joseph; Wilbur, James B. eds. The Worlds of Plato and Aristotle. Buffalo: Prometheus Books. Reeve, C. D. C. (2000). Substantial Knowledge: Aristotle's Metaphysics. Indianapolis: Hackett. Rose, Lynn E. (1968). Aristotle's Syllogistic. Springfield: Charles C Thomas Publisher. Ross, Sir David (1995). Aristotle (6th ed.). London: Routledge. A classic overview by one of Aristotle's most prominent English translators, in print since 1923. Scaltsas, T. (1994). Substances and Universals in Aristotle's Metaphysics. Ithaca: Cornell University Press. Strauss, Leo (1964). "On Aristotle's Politics", in The City and Man, Chicago; Rand McNally. Swanson, Judith (1992). The Public and the Private in Aristotle's Political Philosophy. Ithaca: Cornell University Press. Taylor, Henry Osborn (1922). "Chapter 3: Aristotle's Biology". Greek Biology and Medicine. http://web.archive.org/web/20060327222953/http://www.ancientlibrary.com/medicine/0051.html. Veatch, Henry B. (1974). Aristotle: A Contemporary Appreciation. Bloomington: Indiana U. Press. For the general reader. Woods, M. J. (1991b). "Universals and Particular Forms in Aristotle's Metaphysics". Aristotle and the Later Tradition. Oxford Studies in Ancient Philosophy. Suppl. pp. 41–56. Diogenes Laërtius, Life of Aristotle, translated by Robert Drew Hicks (1925). Ini nga pakli kataposan nga ginliwat dida han 12:15, 16 Septyembre 2014.